I’ve curated a list of nearly 100 exceptional newspaper, magazine and radio pieces published last year. I hope you’ll enjoy it – and spread it around. 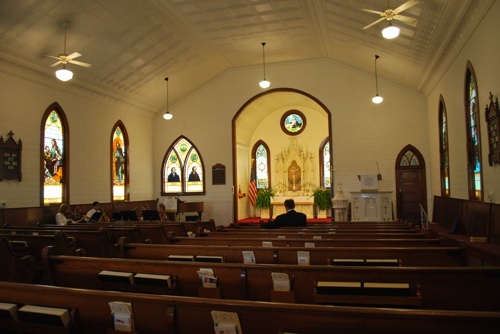 I’ll leave you with a photograph of a Lutheran church in Texas. Do you know what I’d do if I ran a Lutheran church? Install a metal door, just in case. Ha. They have an American flag like ours does. Our pastor was not in favor of national flags in a building of the universal church, but the poor guy had to give in after 911. At least in our present arrangement it is not possible to put a flag next to the altar. On my bicycle outings, I sometimes like to take photos of the juxtaposition of a national flag with Christian symbols. Here is one of my favorites: JESUSAVES Note the USA in the middle. Wow….took a LONG time for that penny to drop. Thanks, Freddie! Maybe that’s why the original church in Wittenberg has replaced its wooden doors with brass ones. Think of it as a 19th century version of the Fairness Doctrine. Wonder if the White House has metal doors. Capitol Building? As someone who grew up in the Lutheran church (ELCA) I think if you’re afraid of people posting theses to the door, you shouldn’t be running a Lutheran church. That said, who knows, maybe these days Luther would have blogged. Although I’d expect a church bulletin board or facebook page might be the more apt analogy. I really agree with your point. Good post. Yesterday, my friend bought a Christian Louboutin Pumps which is so beautiful, i am surprised by the design and style. Do you have a pair of Christian Louboutin Pumps now? if not, go to online store and have one, it is so amazing!! !